Skia Perf is a Polymer-based web application for analyzing and viewing performance metrics produced by Skia’s testing infrastructure. Skia tests across a large number of platforms and configurations, and each commit to Skia generates 240,000 individual values that are sent to Perf, consisting mostly of performance benchmark results, but also including memory and coverage data. Perf includes tools for analyzing such a large corpus of data, the most powerful is k-means clustering. This tool groups large sets of performance metrics together based on how they change over time, and highlights sets of metrics that have performance regressions. 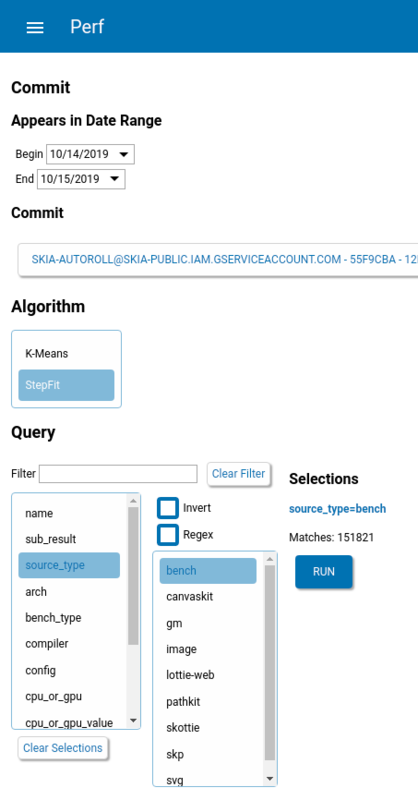 Skia Perf has the ability to perform calculations over the test data allowing you to build up interesting queries. You can also use the data to answer questions like how many tests were run per commit. See Skia Perf for the full list of functions available.